Many parents know honey as no more than an anabolic or energy drink for their kids. Before starting a day fully lined up with activities or participating in a sports competition, honey drink is often suggested as a beverage to help brace the child for the day's challenge. How about finishing the day with a dose of honey? Honey is more than an excellent carbohydrate. Studies related to Hibernation Diet have pointed to the use of honey as the most ideal food that provides a fuelling mechanism for the liver due to its 1:1 ratio composition of fructose and glucose, and hence a great body immunity builder. 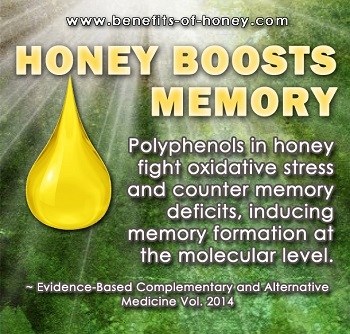 To activate an optimal sleep and recovery cycle, daily give your child a spoonful of honey before sleep. The fructose in the honey goes into the liver, converts into glucose and is stored as liver glycogen for hibernation. With a tiny storage capacity of only 75g of glucose, the liver has a big task of delivering 10g/hour, 6.5g to the brain (the most energy demanding organ) and 3.5g to the kidney and red blood cells. If it is not fuelled sufficiently prior to sleep or becomes depleted during the night fast, the brain would trigger the release of stress hormones from the adrenal glands and degrade the muscle and bone, and the body would not "recover" during your sleep. The over production of stress hormones in the long run, day after day, week after week, can lead to poor immune function and many health ills including obesity, heart disease, osteoporosis, diabetes, hypertension, depression, memory loss and other distressing health problems. Check on your child. Does he or she wake up with a dry throat, feeling nauseous, weak, or exhausted? These may be telling signs that instead of recovering and repairing muscles and tissues, your child's body has produced a stream of undesirable stress hormones during sleep. If you want your child to sleep optimally and enjoy great physiological recovery at night, what could be better and simpler than giving your child a dose of honey before bedtime! Why is honey labelled as the Gold Standard brain fuel in Dr Ron Fessenden's book, "The New Honey Revolution"? Amongst all foods, fruit juices included, why is honey deemed as the most ideal food before bedtime? Why is honey believed to be second to none in fueling the brain, the king of our organs overnight? What can you do to benefit your child's brain development? End of "Hibernation Honey for Kids?". Back to "Honey Diet for Hibernation".